5'1 is the new 6'2: Hats off to you! 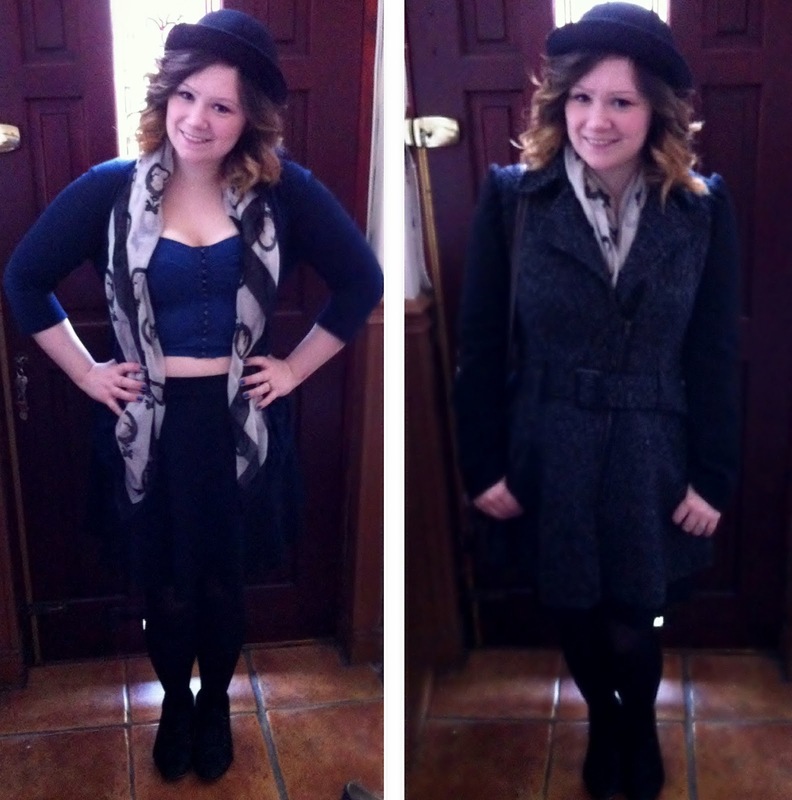 I thought I simply had to do an OOTD post due to the fact I was actually brave with my fashion today! I say brave - ok, maybe not brave. But I did show off a bit of tummy (which is brave for me!) in the British winter (which is brave for anyone!) - Today I wore my Denim Bralet... Eeek! with a delightful scarf and a light cardi... But I topped it all off with my new bowler hat - eeek! I love this hat as far as hat's go this is my new baby! They were in Topshop for £25. But I wasn't willing to part with that amount of money for a new hat - so when I saw the same one in a 'flash sale' on Missguided for a fiver I couldn't say no now could I? Also I know I said I braved the British winter in a crop-top - and technically I did - but I wasn't going to be a silly girl (like many others I saw today) and brave it without a coat on - that would be idiotic since snow is meant to be on the way and finished it all off with my favey coat from Newlook - Another reason why I didn't show as much tummy off as most ladies do. But I kind of reserve that for holidays where the temp is above well 3! Now as for shoes - as it is NEVER a woman's prerogative to forget the shoe aspect of it all - These shoes are, though a bit difficult to see as they blended nicely with the tights, are actually little black ankle boots that I got for Christmas! Anyway - as I do digress easy - Tell me what you think of my outfit! As I give a hats off to myself for being brave and managing to find a bralet style for my shape! Have any of you tried bralets? If so - Hats off to you and tell me about it! I've had the scarf for a while & I always get compliments on it! Doesn't look like a primark number at all. You look beaut! Love your outfit I also want to get one of them hats you got a bargain there!.